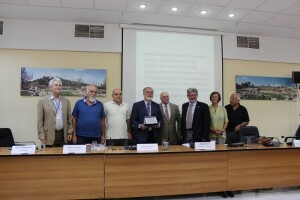 The International Conference on the Environmental Perspectives of the Gulf of Elefsis: A Mediterranean case study where Science meets Society was co-organized on the 11-12 September 2015 in Athens, Greece within the framework of the project “Aristeia I” of the University of Athens by the Laboratory of Environmental Chemistry and the UNESCO Chair & Network on Sustainable Development in the Mediterranean of the University of Athens; the City of Elefsis; the Ministry of Reconstruction of Production, Environment & Energy; UNEP/MAP and MIO-ECSDE. To present the results of the project Aristeia, “Intergrated Study of Trace Metals Biogeochemistry in the Coastal Marine Environment (ISMET-COMAREN)” to the scientific community and the wider society of Elefsis. To compare and interpret that new evidence with data from related programmes (e.g. H2020) within the framework of the 40 years of research on the Gulf of Elefsis, of the Laboratory of Environmental Chemistry as well as within the MEDPOL programme of UNEP/MAP, which also celebrates 40 years since its establishment. The meeting offered the opportunity for MIO-ECSDE to present how it has contributed to the rehabilitation of this heavily polluted industrial area (educational activities, exhibition on marine litter for a number of days, etc.). Furthermore, MIO-ECSDE shared its long-standing experiences and lessons learned in acting on the science-policy-society interface using the marine litter threat as an example. 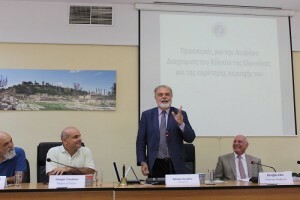 The Chairman, by the closing of the event had a concrete set of proposed actions and measures for the sustainable development of the Gulf of Elefsis. 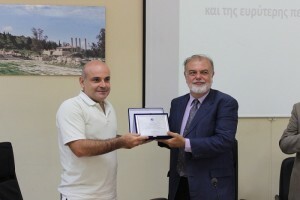 On the occasion of the event, the Chairman was also awarded by the City of Elefsis for his personal unique and impressive contribution to the de-pollution of this area, which dates back to his teenage years.